Objectives: (1) To introduce students to the basic concepts of machines, as used by engineers; and (2) to specifically learn the principles of levers. Complete the questions in the blue box beneath the article. When you hear the word “machine”, you probably think of something like a bulldozer or a steam locomotive. But in engineering & science, a machine is anything that makes a force bigger. So a hammer is a machine. A knife and fork are a pair of machines. And even an egg whisk is a machine. All these machines have one thing in common: when you apply a force to them, they increase its size and apply a greater force somewhere else. You can’t cut meat with your hand alone, but if you push down on a knife, the long handle and the sharpened blade magnify the force you apply with your hand—and the meat slices effortlessly. When you pound a nail with a hammer, the handle increases the force you apply. And because the head of the hammer is bigger than the head of the nail, the force you apply is exerted over a smaller area with much greater pressure—and the nail easily enters the wood. Try pushing in a nail with your finger and you’ll appreciate the advantage a hammer gives you. A lever is the simplest machine of all: it’s just a long bar that helps you exert a bigger force when you turn it. A lever is a rod or bar that turns on a pivot (the fulcrum). The effort applied at one place moves a load at another place via the fulcrum. 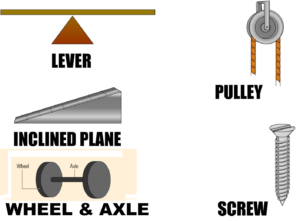 There are three different types of levers, each with the effort, load, and fulcrum in different places. 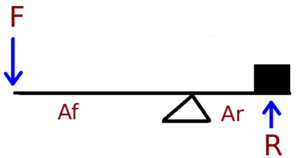 When you sit on a see-saw, you’ve probably figured out that you need to sit further from the balance point (known as the pivot point or fulcrum) if the person at the opposite end is heavier than you. The further away from the fulcrum you sit, the more you can multiply the force of your weight. If you sit a long way from the fulcrum, you can even lift a much heavier person sitting at the other end—providing they sit very close to the fulcrum on their side. The Fulcrum is the fixed support about which the lever moves. The Effort (Force) Arm is the part of the lever to which some kind of force is applied. Its length is equal to the distance from the fulcrum to the point where force is applied. The Load (Resistance) Arm is the part that moves against a weight or other form of resistance. Its length is equal to the distance from the fulcrum to the point where the resistance is concentrated. Levers are all around us. Hammers, axes, tongs, knives, screwdrivers, wrenches, scissors—all these things contain levers. All of them give leverage, but not all of them work the same way. With a long lever, you can exert a lot of leverage. When you use an axe or a wrench, the long handle helps to magnify the force you can apply. The longer the handle, the more leverage you get. So a long-handled wrench is always easier to use than a short-handled one. And if you can’t budge a nut or bolt with a short wrench, try one with a longer handle. Class 1 levers reduce the force needed to move weights. They do this by increasing the distance through which the force acts. For example, a 1-kilogram force acting through a distance of 3 meters can move a 3-kilogram weight 1 meter, if friction is ignored. Speed is lost in a lever of this kind. The weight moves only 1/3 as fast as the force arm. Force (F) multiplied by the length of the force arm (Af) is equal to the resistance (R) multiplied by the length of the resistance arm (Ar). This formula makes it possible to calculate how much force must be applied to a given lever to move a certain resistance. 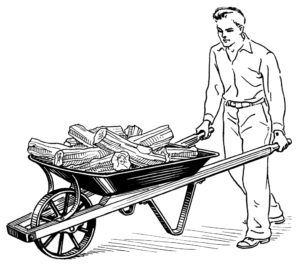 Wheelbarrow is a Class 2 Lever. Name the 5 main types of simple machines, according to the article. What are the 3 parts to a lever? Explain how a class 1 lever works. Draw a diagram of a class 1 lever. Label the parts. Give 5 examples of a class 1 lever. Explain how a class 2 lever works. Draw a diagram of a class 2 lever. Label the parts. Give 5 examples of a class 2 lever. Explain how a class 3 lever works. Draw a diagram of a class 3 lever. Label the parts. Give 5 examples of a class 3 lever. Who was Archimedes, and why should we care what he had to say about levers? Consider the quote attributed to Archimedes in this article. Is this quote LITERALLY true? Explain (give logical reasons in support of what you say) why or why not. Assume you have a 12 foot lever, and 100 pound bag of sand. You want to use a class one lever to lift the bag, but you can only exert 20 pounds of force opposite the bag of sand. 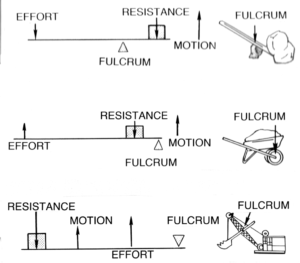 Explain where you would place the fulcrum and why? Show and explain your calculations. Ignore any affect of friction. 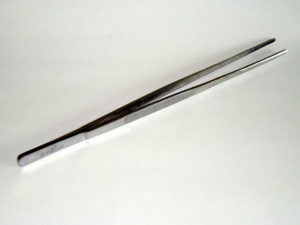 A crowbar is an example of which class of levers? If you ignore the effect of gravity, it is impossible to break a lever, no matter how much force is applied? TRUE or FALSE? A common pair of pliers is an example of which class of lever? Chopsticks are an example of which class of levers? Fill in the blank (the same word goes in BOTH blanks): Third class levers are used in applications where ________ is important. Because a larger force is applied by the effort, the load travels a further distance. Since the load travels a further distance, its ________ is also multiplied. SHORT ESSAY (minimum 10 lines): The article mentions five main types of simple machines. In your opinion, rank these five simple machines in order of importance to modern human beings. Provide a short explanation after each item as to why you ranked it as you did.